If you’re the kind of person that jailbreaks their iPhone in order to customize it to the Nth degree, then altering your notification sounds is no doubt high on your list of priorities. A new jailbreak tweak sets about making just that as easy as possible, but it’ll cost you $1.99 for the privilege. Many of us tend to keep our iPhones just the way God intended them, and that’s with the silent switch firmly in the "on" position. There really is no need to have an iPhone beeping and burping its way through life in our opinion, and there’s nothing worse than listening to someone’s obnoxious ring tone from afar. It seems some people disagree with this notion, and while it may well be the perfect subject for a well-placed rant in an upcoming editorial, it appears that some people actually like to have push notifications make a variety of weird and whacky noises. If this sounds like you, then you’re going to love PushTone. 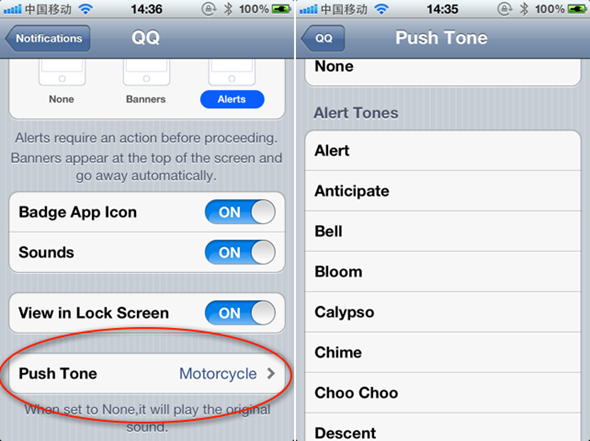 A jailbreak tweak that will set you back a couple of dollars, PushTone will give users the control they have been yearning for by allowing them to customize the noises made when a push notification is received. If that doesn’t sounds useful then this will pique your interest – PushTone allows the setting of push notification tones on a per-app basis. What all that boils down to is simple. Want your Twitter app to make a particularly irritating sound each and every time someone sends you an @ reply? No problem. Want Skype messages to be accompanied by a completely different sound? Then you’ll be wanting PushTone. Whether the $1.99 is worth it to you very much depends on the level of customization you want to go for, and if you just want to change one tone then this might not be the best way to go about it. If, however, you want to have widespread control over how push notifications are handled when it comes to beeps and bops, then PushTone may well be the jailbreak tweak for you. For the rest of us, there’s always that silent switch! PushTone can be downloaded via the BigBoss repo, just like any other self respecting jailbreak tweak is!